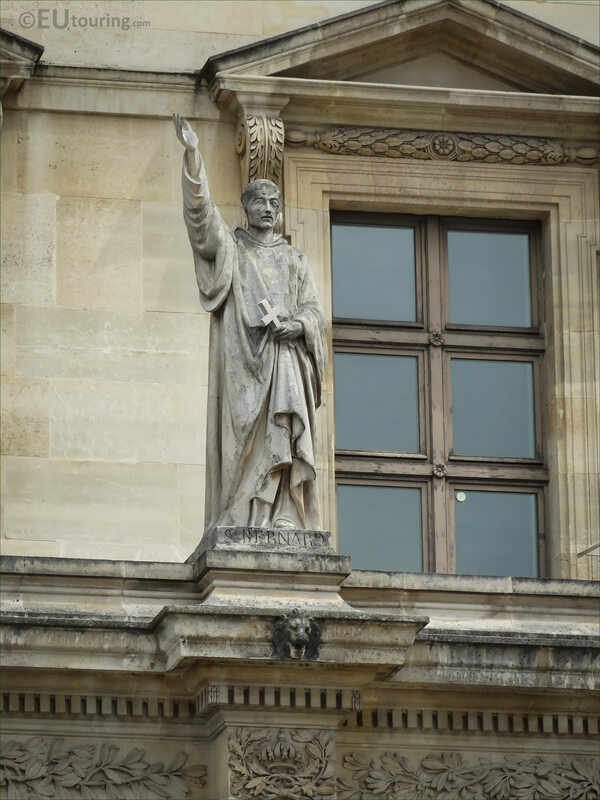 Again we were admiring the decorations of different statues that adorn the facade of the Aile Colbert wing of the Musee du Louvre in the 1st Arrondissement of Paris, when we took these high definition photos showing a statue of Saint Bernard sculpted by Francois Jouffroy. When the Palais du Louvre was having different embellishments and statues added, Francois Jouffrey was one of the artists commissioned for some of the works, and this particular statue of Saint Bernard can be seen from the Cour Napoleon and is located on the first level facade of the Aile Colbert, the third from the left hand side. And in this HD photo you can see some of the details that went into producing this stone statue by Francois Jouffroy who was born in Dijon in February 1806 and he attended the local drawing school before entering the Ecole des Beaux-Arts in Paris. He became a French sculptor, winning the Prix de Rome in 1832, and from then on received numerous different commissions for public and historical buildings throughout Paris and other areas of France, eventually passing away in 1882, but leaving a great legacy of works behind him for people to still enjoy today. 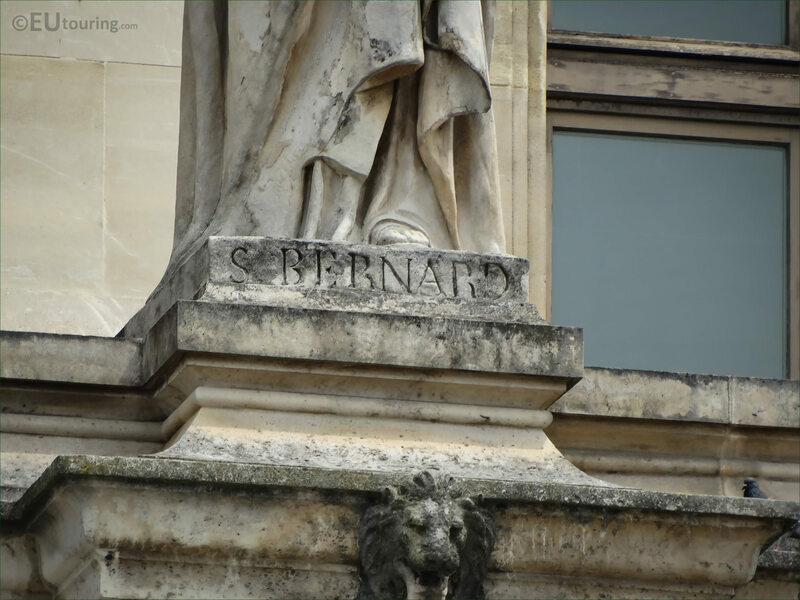 In fact, Francois Jouffroy also produced an additional statue of Saint Bernard which is now held at a cathedral in Arras, and this was twenty years after the one you have seen in these images, which was put in place on The Louvre in 1857. 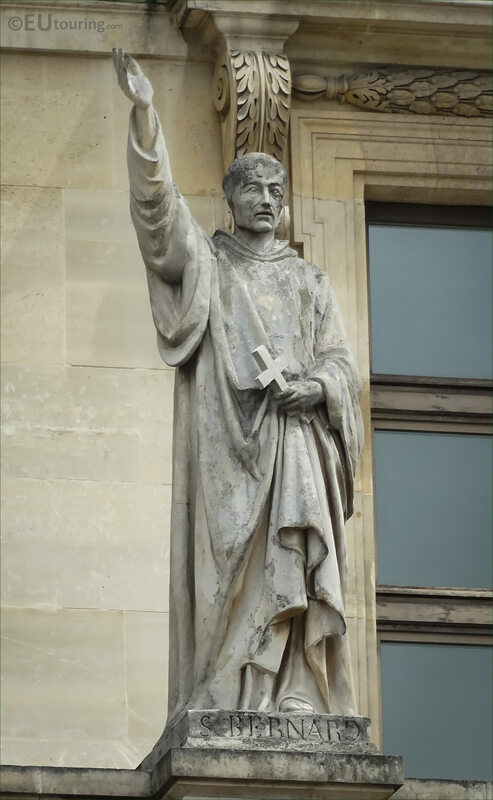 And it was sculpted to depict Bernard of Clairvaux who was born in around 1090, and became a French abbot and the primary builder of the reforming Cistercian order, and died after 40 years spent in the cloister. Plus he was the first Cistercian placed on the calendar of saints, and was canonized by Pope Alexander III on 18 January 1174, yet in 1830 Pope Pius VIII also bestowed upon Saint Bernard the title of Doctor of the Church.